The Celebrity Cup sponsored by Bulmers will make a welcome return to the Celtic Manor Resort this summer, and you could be in with a chance of winning a pair of tickets for you and a friend to attend the star-studded golfing event! Mixing golf with glamour, stars from the worlds of sports and showbiz will once again tee up for a weekend of fun and frolics when the Celebrity Cup returns this year. Some of biggest athletes and celebrities will swap paparazzi for putters and battle it out in teams representing Wales, England, Scotland and Ireland. Famous faces taking to the course at this year’s tournament include rugby legend Scott Quinnell and TV presnter Gethin Jones hoping to hit a hole in one on home turf for Wales; Mrs Browns Boys’ Brendan O’Carroll and singing superstars Ronan Keating, Keith Duffy and Brian McFadden aiming to score an ace for Ireland; rugby superstars Rory Lawson,Greig Laidlaw, Thom Evans and Max Evans teeing up for Scotland; and TV personalities Denise Van Outen, Peter Jones and Bradley Walsh pitching in for England. This year I am attending with my husband and we can't wait. 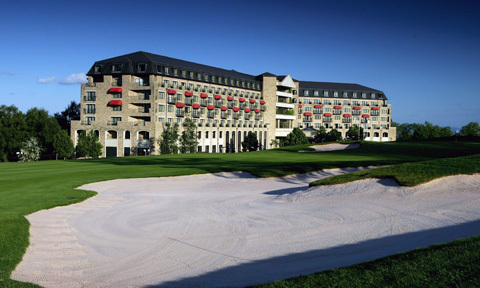 The Celtic Manor is a beautiful hotel and every time we visit we always feel like we've been away on holiday. For more information and to purchase tickets, visit the https://www.celtic-manor.com/whats-on/the-celebrity-cup/about-the-celebrity-cup or call the reservations team on 01633 410 262. To be in with a chance of winning the tickets, simply enter via Rafflecopter below. Sounds like a great event and what an awesome prize! Would love to win tickets for this! Would be suportings Wales all the way! Has to be Wales. Just has to be Wales.